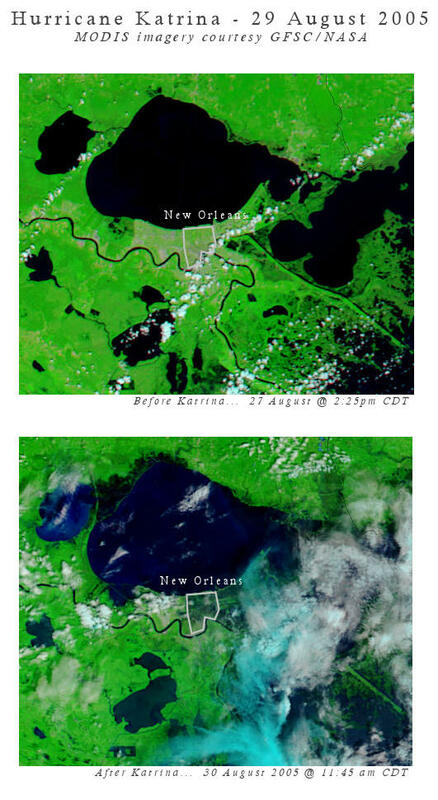 Here is a before and after MODIS image (courtesy of NASA) centered on the Lake Pontchetrain/New Orleans area at 250 meters resolution. The extensive flooding is quite clear as you can see. It’s Tuesday, August 30th. I just got home from my midnight shift and after watching the reports of New Orleans’ levee breach filter in during the morning hours while at work, I just had to keep myself up when I got home to see some of the “first of light” images from New Orleans. The video I saw shown in Fox news was just utterly disturbing. Completely. If this isn’t New Orleans’ “big one”… “worst-case scenario”, then it is damn close. Marshall Law in effect.. this is completey, and utterly incredible. Everyone must get out of New Orleans. I don’t know what to say. Water continues to fill the city. An unprecedented meteorological event is about to take place, the likes of which I have never seen while I’ve certainly been alive. It is the ultimate perfection of atmospheric violence: A tropical cyclone in an environment so perfect, you cannot script it better. It is late August and Gulf of Mexico (GOM) sea surface temperatures are around 32 degrees C, which equates to 88-90 degrees F. This is incredible ocean heat energy that is only found in very few oceanic locations around the world. Locations that can typically breed “super” cyclones. 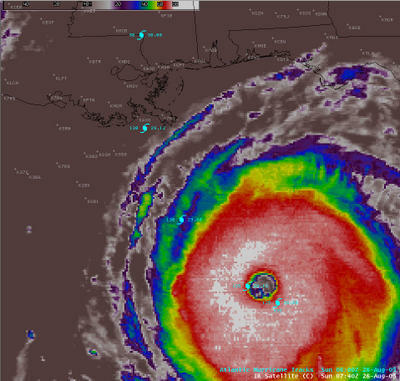 Katrina is no exception, with an incredible 910mb central pressure at the time of this writing, it is a mere 30 hours away from “ground zero” landfall precariously close to the worst possible landfall location on the United States Atlantic-basin coastn — New Orleans. A category-5 hurricane making landfall moving north, directly into New Orleans, *WILL* create the most incredible natural disaster in United States history. Period. This *doomsday* scenario has been played out in computer model simulations, according to a well-written series in the New Orleans Times-Picayune. Upon reading this entire series and studying the graphics…. then putting the NHC forecast track of Katrina in the place of “the big one” in the story… I began to get a lump in my stomach, and I don’t even live in the area. Katrina is certainly the perfect storm. I have NEVER seen intensification overnight like I have seen while on my midnight shift forecasting the weather for my own area of the world in western Kansas. When I got in to work it was 115mph/936mb. Upon leaving work it is now 160mph/908mb. (Yes, it has dropped 2 more MB since I began typing this blog entry!). It is phenominal, incredible, just flat out awesome Nature. It’s just a shame that a population of 1 million plus will be affected. But this scenario is most definitely inevitable as people continue to flock to the shores.